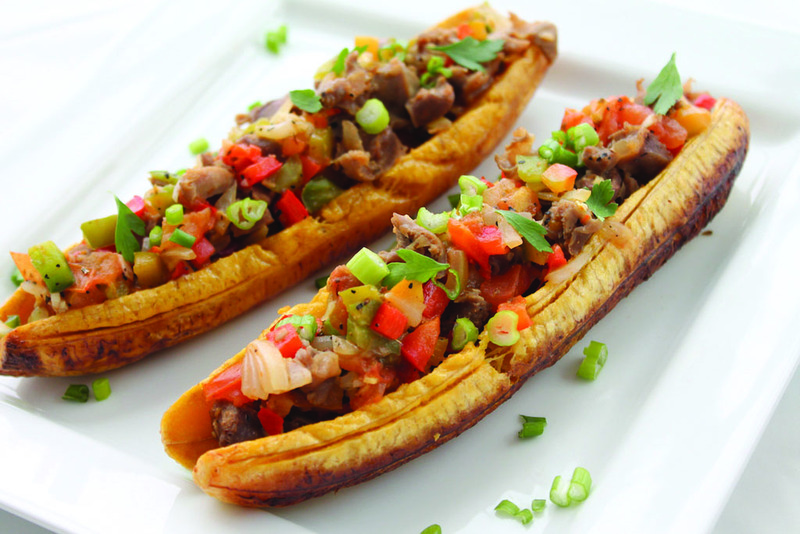 Today’s recipe, colourful stuffed plantains, is a healthier break away from the usual fried plantain. The plantains in this recipe are baked first and then stuffed. Peel plantain and make a slit down the middle. Brush with melted butter. Preheat the oven to 400F and bake plantain for 40 minutes. Dice all the vegetables (onions, peppers, tomatoes, garlic, ginger etc) and cut the gizzard into small bits. Heat two tablespoons of oil in a pan and lightly fry gizzard till half cooked, then add the veggies and cook until tender. Take plantain out of the oven once cooked and stuff with the gizzard. Garnish with parsley and spring onions. Serve immediately with a side of pepper sauce.